We all know that, like the iPad, the introduction of iPhone OS 4 will allow iPhone users to utilize Bluetooth keyboards and remote controls. However, there was some speculation originally over the function keys and what they would do on the iPad. Either way, there are most likely many iPhone users that will want to take advantage of a keyboard on their iPhone but cant imagine if it would be that practical. 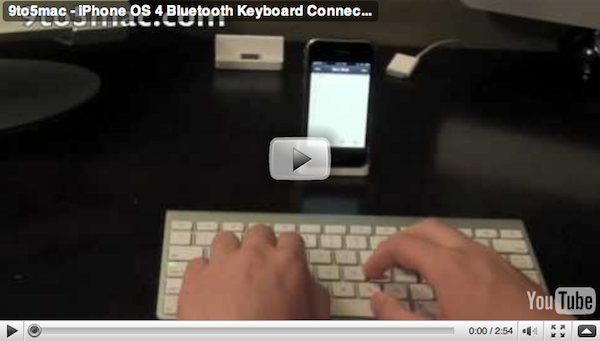 Well here’s a video demo of the iPhone OS 4 Bluetooth keyboard features from our friends at 9to5mac. Hopefully app developers and Apple will look past the Bluetooth keyboard as simply being just an easier way to type and let us play games on our iPhones and iPod Touches using a keyboard. There is no word as of yet whether developers will have the ability to let users play their games using a connected Bluetooth keyboard or possibly a gaming controller or peripheral. Do you think that using a full sized Bluetooth keyboard on the iPhone or iPod Touch would be practical in everyday situations? Advanced Photo Editing Features in Future iPhone/iPad?